Last week I met John Zachman. I wrote about Mr. Zachman and the Zachman model he created earlier. 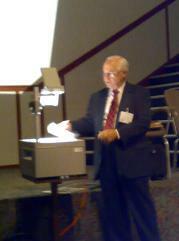 Mr. Zachman gave the keynote speech on the EAM congress in The Netherlands for about 150 IT architects. The talk was about architecture, and why it is needed. Check here for the slides (push the right-hand button for the next slide). According to Mr. Zachman, architecture is needed in any system (in IT or otherwise) that has much complexity and a need for change. The reason for this is that if you cannot describe a system, you cannot build it, let alone change it. For systems with low complexity, a architecture description is not always needed, a technical design is enough. The most important skill an architect needs is what Mr. Zachman calls "drafting skills". Next, Mr. Zachman explained the reasoning behind the Zachman architecture model. He calls the model an Ontology (no methodology), because it describes what needs to be done to create complex systems. The model was created after consulting many construction engineers, architects and other specialists. Mr. Zachman pointed out that no one can get his brain around the complete architecture, so it has to be cut into pieces. As he stated: "creating for instance a data model is hard enough in its own right, let alone understanding the connection with interfaces, processes, strategy, etc.". When the architecture is cut into pieces, like it is done in the Zachman model, it can better cope with change. It is a misconception that flexibility can be reached by creating higher granularity. Flexibility can only be created by separating independent variables, like it is done in the ISO networking stack. Mr. Zachman is a gifted speaker who speaks faster and faster as he gets excited telling his story. He used old fashioned overhead foils instead of PowerPoint. After the talk I met him and talked about half an hour with him about my thoughts about the position of architecture, his family and his frequent travelling.